First safety tips ,or common snow distress emergencies, can be of some benefit to know,especially when venturing beyond the boundries. I have compiled a list of most common conditions which can afflict you on your ski, or snow adventure. Altitude Sickness –not just relevant to climbers but also us skiers who can descend 1 vertical kilometre in less than 1 hour, or be whisked up on a lift over one vertical kilometre in under 25 minutes. As the altitude changes the way your body behaves to derive oxygen from the atmosphere changes. If you are ascending to high regions ,whether in a high lift gondola ,or hiking with skis on your back,the rate of breathing increases. At higher altitude, less oxygen is available. As the body needs oxygen to survive, the heart rate needs to speed up to pump more blood through to the lungs. The result is, breaths become shallower and faster as your body tries to derive more oxygen from around you. As the heart is racing the body starts to perspire.The consequence of this is you lose fluid. This loss of fluid leads to your blood volume diminishing, similar to a car radiator leaking out fluid. Now you have reduced blood volume with the crucial cells still present inside the blood .This causes the blood to become thicker. Kidneys which filter and pass out fluid start to malfunction.This kidney response compounds the problem.Some of us will end up with kidney pain. In addition to this, red blood cell production is on the increase. Body needs oxygen,red blood cells carry it, so the body increases red blood cell production to compensate. The consequence of this is the blood starts to thicken even more. Think of it as adding a thickener to a can of paint. So up untill now the blood volume is diminishing and the blood is thickening .Both of these changes lead to a dangerous combination. New dilemma arises, thickened blood cannot flow well into small blood vessels, and parts of the body begin to starve of oxygen. First affected are organs carrying small blood vessels which are exposed to cold, most often fingers and toes.Parts of tissue slowly die.We have a slow domino effect unfolding. The next event is, lungs ability to exchange oxygen or absorb it into the blood stream is compromised. The microscopic vessels no longer carry blood effectively to the lung. You are really feeling unwell now. Lungs start to swell up .They fill up with fluid and you are on the way to an accelerated decline. 4/ an irritating cough, coughing up blood. The next stage is, brain tissue itself swells up. This is referred to as cerebral edema. Fortunately edema results when exposed to altitudes greater than 2700m for at least a day without allowing 2 days of acclimatization. Most commonly experienced at altitudes above 3000m. The recommended rate of ascend beyond 2700m is 600 vertical metres per day. So as a first safety tip, if you are hiking with skis on your back take it easy and don’t ascend too quickly.A lot of ski resorts are in the 1600-2500m range ,so most of us will be quite safe and symptom free. If you are the health conscious type ,I will give you another first safety tip, should you experience altitude sickness at 1500m above see level there is a chance you may have unusually narrowed off pulmonary artery.This is the artery which connects from your heart to your lungs. This is a genetically inherited condition, get yourself checked out. Visit these snow first safety pages if you want to get extensive medical information. Frost Bite - occurs when blood supply to a tissue closes off ,and cells freeze ,some of them begin to die .This usually manifests on body’s extremities such as fingers or toes. If present long enough lack of nutrients supply causes complete tissue death. For extremely cold weather ,as a first safety tip I recommend thick woollen socks or perhaps two layers of, to fit into your boots. Merino fine grade wool is excellent. As for gloves ,multiple layering inserts are good.The outer being water resistant ,inner insulating and if you are on an overnight snow expedition, a skin wrapping layer. Snow Blindness results when you sustain ultraviolet damage to the external clear eye tissue called the cornea.This can be very painful. Symptoms manifest themselves the next day. Eyes feel gritty ,photophobic ,vision can be blurred ,they are also watery and often painful. The best first safety tip is rest and protect the cornea from injury during the recovery phase. Allow at least 24hrs. For proactive individuals rinses of the eyes with salty water helps the swelling subside. Try a teaspoon of table salt per cup of boiled water (assuming sanitation) and rinse the eye with it. Wrap around sunglasses with UV filters provide good protection. Hypothermia presents itself when there is a drop in your body’s core temperature. Exposure to excessive cold ,leads to the body’s metabolism slowing down. Your optimal function and endurance ends up being compromised. The blood is shunted to vital organs to keep you alive. Abdomen, heart and lungs receive this vital blood supply. Peripheral circulation starts to close off. Being mindful what can occur, try to look out for symptoms of hypothermia before they become well established. For reducing the likelihood of hypothermic symptoms I suggest starting with right insulative clothing. Wind Chill Factor think of this as an index or rate of loss of heat from the skin by wind and cold.We know as the wind speed picks up heat is drawn away from the body at a faster rate ,cooling you,driving not only your skin temperature down but eventually body core temperature. 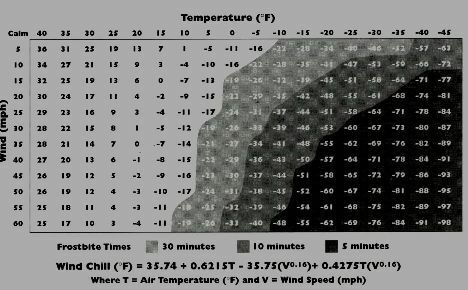 As an example; if the wind is 10mph and it is -5deg F wind chill factor is equivalent to -22deg F. Putting this in another way, it feels like the outside temperature is -22deg F with no wind .If you follow the graph ,exposed tissue will freeze in 30 minutes. As the wind picks up to 35mph and it is still -5deg F wind chill factor becomes -34deg F, tissue will freeze in 10 minutes.The only first safety tip I have here is to clothe properly. The table below is useful for longer expeditions particularly if you are stranded away from the civilization. The assumption it makes is that your skin is exposed to the elements,and not covered by insulative clothing. Temporary snow camp. Stranded or lost, consider making a temporary camp, at least until you can gather enough strength to move to more sheltered ground. First safety tip, select a site out of wind. Dig the best trench you can, enough to accommodate you in a rolled up position. Use poles or tree branches to roof the shelter before covering it with snow. Try to stay as dry as possible whilst digging through the snow. If the skis are still with you cross them above your site. This symbol signifies distress to the rescue party. Strapping brightly coloured straps to the erected skis is very useful. Inside the shelter try to insulate yourself from snow .If you have twigs and a lighter with you light up a little fire .This will help your body core temperature stay up. If the blizzard is not subsiding try to stick it out. Reach into your back pack for food snacks. Perhaps one of the most obvious and easiest first safety tips is, when skiing in an unpatrolled area let someone know beforehand, if at all possible. Make use of log books provided by some chalets. Avalanche first safety. The extent of advice regarding avalanches, and safety is aboundant.A number of factors are at interplay which can contribute to avalanches; such as temperature, extent of snowfall or precipitation, orientation of the mountain side, gradient of the slope, and the list can go on. If this interests you, I have prepared a list of avalanche facts, as knowing these may make your next snow journey safer.